So and Mamedyarov take points while Wei and Adhiban falter. A draw in Giri-Anand gives the lead to Mamedyarov. 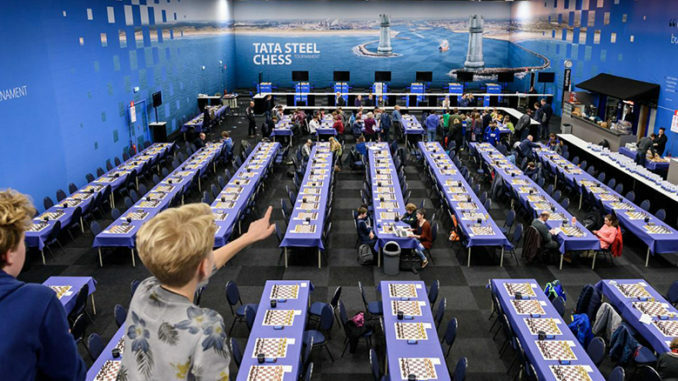 The 80th edition of the Tata Steel Chess Tournament will be held 12-28 January 2018 in Wijk aan Zee, the Netherlands. The Tata Steel Chess Tournament 2018, continued after Thursday’s rest day, with round 6 taking place on Friday 19th January. Play returned to Wijk aan Zee following round 5 in Hilversum. 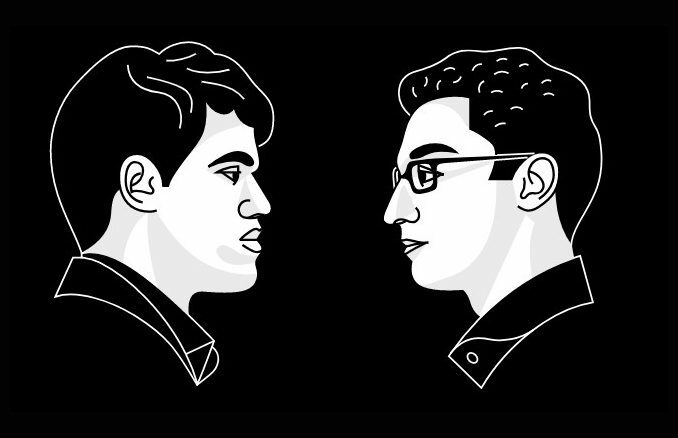 All eyes would be on the boards of joint leaders, Anish Giri and Viswanathan Anand, (who would play each other in this round), and Shakhriyar Mamedyarov. These three players were at the top of the standings at the rest day, with 3.5/5. Winners of the round, were American Grandmaster Wesley So and Shakhriyar Mamedyarov of Azerbaijan. Both would win with the Black pieces. So would get the better of Wei Yi of China, who was looking pretty good in their game until he made a mistake that would prove very costly. The game was a Reti and White obtained the best play, Black having a rather bad time of things out of the opening. 15…Nxe4 (…Na5 was a good alternative) was the start of some discomfort for So, who had allowed Wei to take a firm and positive grip on the Queenside. As the diagram shows, the game reached a quite crazy position. Black has just played 25.Qh3-h8 — with the threat of …Qa1+. This would be big trouble for White, forcing Bd1 and then allowing …Rxf1+ followed (after Ke2) by …Qxd1+. Suffice to say, that the threat of …Qa1+ must be answered. However, once White has answered this, he holds all the cards. It is true that his Rf1 is shaking in its boots, but this is irrelevant when compared to White’s activity and Queenside pressure. The pawn on a6 is in itself very strong and White also has the potential to use the b-pawn in its support. With everything put together, White has the more potent position. However, that is dependant on dealing with the threat of …Qa1+ correctly and unfortunately Wei’s 26.Rd4(?) should have given way to 26.d4(!) after which Black has nothing better than 26…Bxf1. The drawback of this move, is that it takes the bishop off of covering White’s queening square of a8. So, after 27.Qb5+ Nc6 28.Bxf1, Black has done very little to hamper White’s plans. Infact, it is probably a strategically won game. As it was, 26.Rd4 saw Black delivering a couple of serious blows to White. There followed: 26…Bxf1 27.Qb5+(? this does not work now for tactical reasons, White had to settle for Bxf1 with equality) 27…Nc6 28.Bxf1 Rxf1(!! This is a sublime move, seizing hold of the game due to the positioning of the White Queen and remaining rook) 29.Kxh1 Qh1+(! Now the White King must go to e2) 30.Ke2 Qh5+(!! and now White must lose either Queen or rook, so his next is forced) 31.Qxh5 Nxd4+(the knight now being unpinned, seizes the rook). After 32.exd4 gxh5 all the cards are suddenly with Black. A few moves later, Wei was resigning. A very disappointing result for him, especially considering that just a few moves before he had the game at his mercy. And this seemed to be the pattern of this round, as Baskaran Adhiban also relinquished a good stance as White and ended up losing. He played Shakhriyar Mamedyarov and got the best out of the Symmetrical English. As in the above game, he also obtained two strong pawns on the Queenside, but these were also backed up by an immense bishop pair. To say that White was dominating is a huge under-statement. The diagram, below shows the position after Black’s 44…Rd3. 45.Be3 was a slight inaccuracy by Baskaran, it was far better to challenge the Black rook with 45.Re3. The point is, that Black does not want to be exchanging, here. His stance is so bleak at this point, that he wants to be able to play …Ra3, with the dual possibilities of …Ra1 in support of his own passed pawn and giving rook for pawn and bishop on a7, which is about breaking even. Re3 would have removed those possibilities, when Black is probably best withdrawing the rook (to d6 most likely) rather than exchanging. Trading on e3 would do nothing but empower White and increase the consequences of his Queenside pressure. Any giving of the exchange later on, would leave Black with no rooks which is as good as resigning any endgame. Personally, I think that 45.Re3 may have in effect been a winning move. As it was, after 45.Be3 Ra3, Baskaran then decided to advance immediately with 46.a7. It is hard to say whether this was mistaken or not, though there were alternatives of 46.g3 or 46.Bg1, which is a constructive waiting move. After 46.a7, it is true that Black is forced to give the exchange of a rook for bishop and pawn. However, as already mentioned, this is about breaking even and one of White’s trumps is now gone for little profit. Certainly, after 46…Rexa7 47.Bxa7 Rxa7, White’s pressure was substantially lessened and Black was back in the fight. And from here, Adhiban’s situation rapidly deteriorated, while Mamedyarov’s gradually improved. I can well imagine that Baskaran was feeling a little bemused at how his initiative had evaporated and thinking of what might have been upon 45.Re3. The game would last for 86-moves and for the rest of the game, White was outplayed, which left Mamedyarov with the point — and as it would turn out, lead of the tournament. 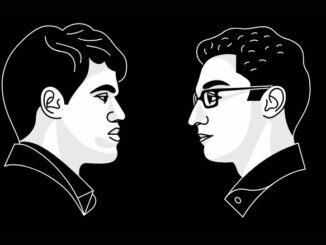 My hopes for the game of Anish Giri against Viswanathan Anand, (the other two leaders), was that they had aspirations of sole lead. Sadly, it wasn’t the case. Their Open Catalan saw neither of them really try anything and they gradually made exchanges until splitting the point on move 20. As it turned out, this meant surrendering top position to Shakhriyar Mamedyarov. Elsewhere, Peter Svidler and Magnus Carlsen certainly pushed the boat out in their game. It was an English Opening with a bit of Queen’s Gambit Declined thrown in. Black had little problems in equalising (at the very least) and the game took on a sharpness with both players having to be spot on accurate or land in hot water. The played impeccably and put on quite a show — draw in 31. Hou Yifan could not have been expecting the Caro Kann from her opponent, Sergey Karjakin. Apparently, the Russian has never played it before! As exciting as this fact may be, the game itself was nothing to write home about and ended in a comfortable draw. Likewise for Caruana-Matlakov, who exchanged down steadily in a Spanish. Gawain Jones and Vladimir Kramnik got into a King’s Indian Fianchetto variation in their game. And this spiced up quite a lot when the former World Champion let his Queen go for rook and bishop! White clearly had the better pieces and more active position, especially with a passed b-pawn all the way on the 6th rank. Unfortunately, Kramnik wasn’t able to make this pay. There is no question that Jones was better in the final position, but White had more than enough resources to prevent conversion so the players shared the spoils. Matlakov, Maxim – Adhiban, B. The Challengers group saw Anton Korobov taking yet another win, this time against Norwegian Junior World Champion, Aryan Tari. This keeps Korobov out in sole lead of the group, a whole point ahead of his nearest rival, Gujrathi Vidit. So far, then, it is looking like Korobov or Vidit for next year’s Masters. It would certainly take a brave gambler to be going against Korobov at this point. However, it must be noted that Lucas van Foreest is performing extremely well and not very much has to happen in the next rounds for him to be a big spoiler. Tata Steel and the organisers of the Tata Steel Chess Tournament.